Quereus floribunda, Rhodedendron arboreum, Nynee Tal (the hill on the opposite side is where the slip was). bl.uk > Online Gallery Home	> Online exhibitions	> Asia, Pacific and Africa Collections	> Quereus floribunda, Rhodedendron arboreum, Nynee Tal (the hill on the opposite side is where the slip was). Photograph of Quereus floribunda, Rhodedendron arboreum, Nynee Tal, from the 'Strachey Collection of Indian Views', taken by Samuel Bourne in 1865. 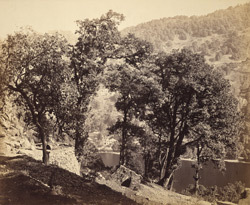 In the 19th Century the area around Naini Tal was favoured by the British because it ideally suited their Victorian taste for the romantic pastoral. It was chosen owing to its pleasant climate and spectacular views of forests of pines, firs, cedars, rhododendrons and rows of snow capped peaks disappearing in the distance. It became a venue for leisure activities and the area rapidly acquired a reputation as a sanatorium.